The Go Big Read book, "I Am Malala" has spurred many conversations on campus about education, women, and Islam. If an individual only watched mainstream "breaking" news they may falsely associate Islam with the Taliban, terrorism, or oppression. However, "I Am Malala" has sparked a different dialogue on campus. A conversation that focuses on strong Muslim girls who value education, whether it is Malala who had to overcome unimaginable barriers, or Shiza who has used her education and power to help others. Even though conversations have been started, many stereotypes still exist about Islam on our own campus. Naman Siad, UW Madison senior and President of the Muslim Students Association, understands what it is like to have her identity questioned and have false stereotypes applied to her. In her Badger Herald article she says, "My scarf has often been an object of conversation, often invoking questions about "Where I am really from," and "How is my English so fluent." My answers always shocked people when I said I was from Madison and that my English better be fluent as it was my first language. I would often be frustrated with these types of situations. While my fellow classmates were never questioned on their American identity, I would often struggle to "prove" myself." Naman and the Muslim Students Association realize that the campus conversations about "I Am Malala" are an opportunity to break down stereotypes and false assumptions in the student body. This Friday students and community members have an opportunity to be a part of a conversation surrounding women in Islam. The Muslim Students Association is holding a panel event tackling the misconceptions of Women in Islam and showcasing a positive image of successful Muslim Women across America! The inspirational panel will talk about the role of Muslim Women from three different perspectives. 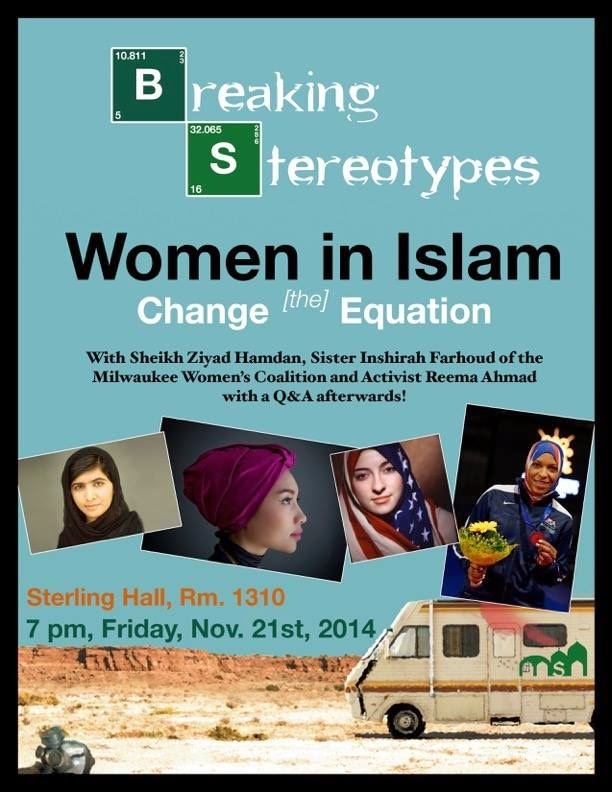 The event is at 7 pm Friday, Nov. 21st, in Sterling Hall Rm. 1310.